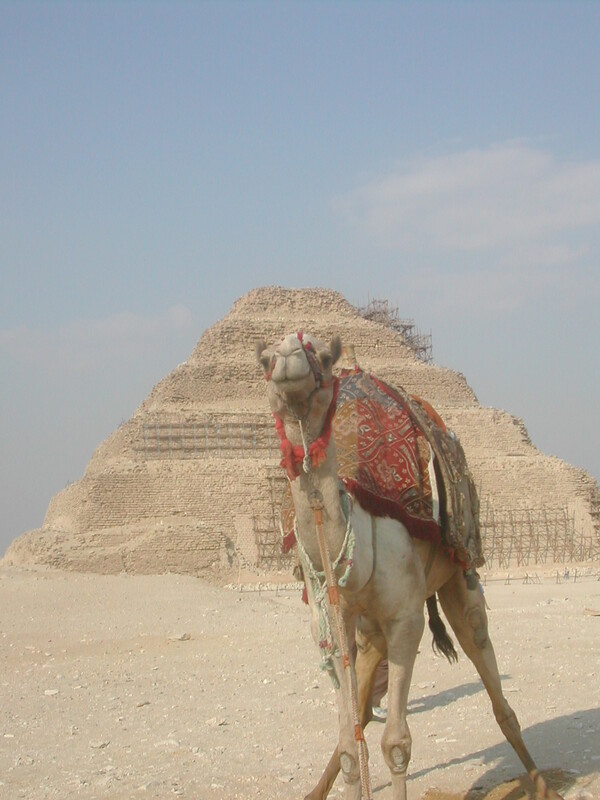 Sakkara Step Pyramid and a camel. 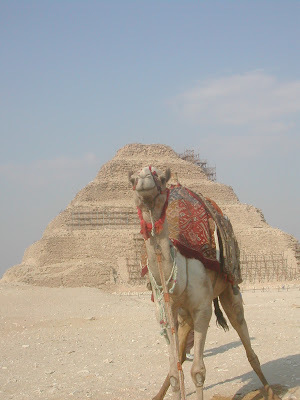 Camel rides are one of the things on offer at the pyramids. I'm finding it difficult to breathe. Without my inhaler, I'd be practically dead. Oh, for the clean, hot air of Aswan! 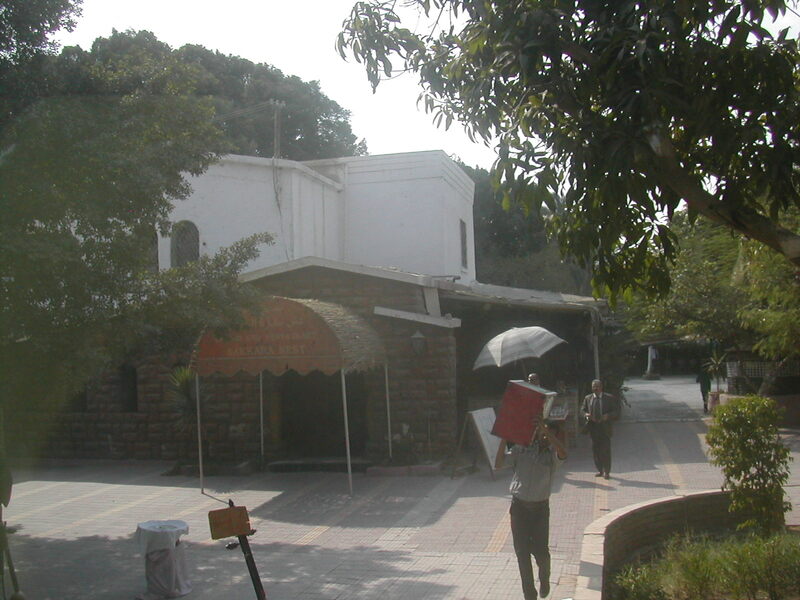 We walk through the cool morning air to the main building, where our restaurant is. We pass a chambermaid. A woman! There is a huge spread for breakfast, as there was for dinner, and I can eat everything again, thanks to the tablets I'm taking now, but the food isn't as good as it was on the "La Traviata". Peter and I find empty spots next to Anja, whom I met through Claudia. Anja is lovely. She's traveling alone - no partner. She's so pretty and gracious, I'm surprised she's solo. This is her second trip to Egypt, and she's always dressed perfectly for whatever we do - she never exposes her legs, wearing attractive but modest trousers, always carrying a complementary scarf to cover her head and arms if necessary, or to protect her head from the heat. We talk about her work. She's one of the few people who have talked about their jobs. Some of these Germans are so private, they share nothing but the barest details of their lives. My husband is one of these. Not so secretly, though, Peter admires me, who shares almost as much as people can accept hearing. Sometimes I embarrass him with my openness. But then, this is what he gets for marrying an American. I comment on Anja's openness. "Well, you see, I always watch and wait a few days to see if the water's safe to swim in. Now I know I can talk to you." She's a controller for a company in the east of Germany, but lives in what was once called "West Germany". I ask her how it is, working with a bunch of "Ossies", as the people in the east are called. "They're unbelievably private. They share nothing! They've been damaged by having lived under a brutal, oppressive political regime. At first, I thought they were all cold, but I was determined to find a way to connect." Ah, a woman after my heart! No wonder I like her so much. Most west Germans haven't even been to the east on vacation. "I kept looking for an opening. One day I found it - in my colleague's shoes." "Well, she had the most amazing shoes. One day she came with a pair of really unique, beautiful red shoes. I complimented her shoes. That broke the ice, and from then on, all the people there accepted me." Anja believes in finding ways to connect. I've already heard her talking to Claudia about how you can always find a way to the hardest person's heart if you find something nice to say to the person. Yay, Anja! Way to go! And I've got a few things to learn from you, even though I normally practice the same thing. But I am exhausted from the bronchial and sinus problems of the past few months. I still don't like Icicle Eyes very much, but there's another person I can't stand - Kurt, the Austrian. He is a pure cynic, it seems, never bothering to talk to anyone, to ask any questions. Mister Cool. He offered Mohammed a Cuban cigarette the other day. I avoid him whenever possible - and his partner, Ms. Pouty Lips. She's always dressed like a fashion model, holding herself aloof from the group. As far as I can tell, there are four people she condescends to relate to - her parents, who are also in our group, a travel writer whose husband also writes travel articles for a reputable German newspaper, and sometimes her partner. And Mohammed, of course. Even though I admire Anja's attitude, I'm not even slightly interested in getting to know Mister Cool or Ms. Pouty Lips. Nor are they interested in me. I'm also learning something - I don't have to be friends with everyone. After a short bus ride, we arrive at the famous pyramids. Cheops, the only one of the seven wonders of the ancient world still standing, is the largest of the group here, and it is a massive 138.8 metres (455.4 ft) high. I am surprised that it is not smooth. It looks more like a series of steps, leading to a point at the top. Mohammed tells us that it was once smooth, covered with white marble, probably crowned with gold. It must have been an impressive sight. Vandals, particularly the Romans, have taken the covering, bit by bit, until there was nothing left. You can still see bits of the covering on the neighboring pyramid, Khafre. He tells us that the Pharaoh Cheops was not as cruel as his reptation. He hired workers - they were not slaves, and he paid them well and fed them. They only worked in the summer months, when it was too hot to work at their normal professions, and he had enough workers so that no one was overworked. They worked in the mornings and evenings. Mohammed leaves the group 45 minutes to walk around, explore a pyramid, or go into the exhibit displaying a boat, one of the funerary relics excavated near the Cheops pyramid. Peter and I decide to walk around the Khafre pyramid, the one in the middle. The air feels better here than at our hotel. We are on higher ground, away from all the fumes of Cairo. We can see it, however, hazy from the smog and morning mist. Cairo is ever-expanding, spilling out all around the pyramids. For a few minutes, on the other side of the pyramid, we are all alone. We run into Claudia. Her shoulders are heaving. She's struggling for breath. "I don't know," she wheezes. "I've never had this before. I can't catch my breath." She coughs weakly. I teach her how to use my inhaler, but it doesn't help much. Her voice is raspy. That cough sounds nasty, but she soldiers along with us anyway. This is the trip of her life. This is the honeymoon she and Burkhard were never able to have until now, 22 years later. "Into the bus! We'll make a Japanese break." What's a Japanese break? Getting off the bus to take photographs, then getting on again. 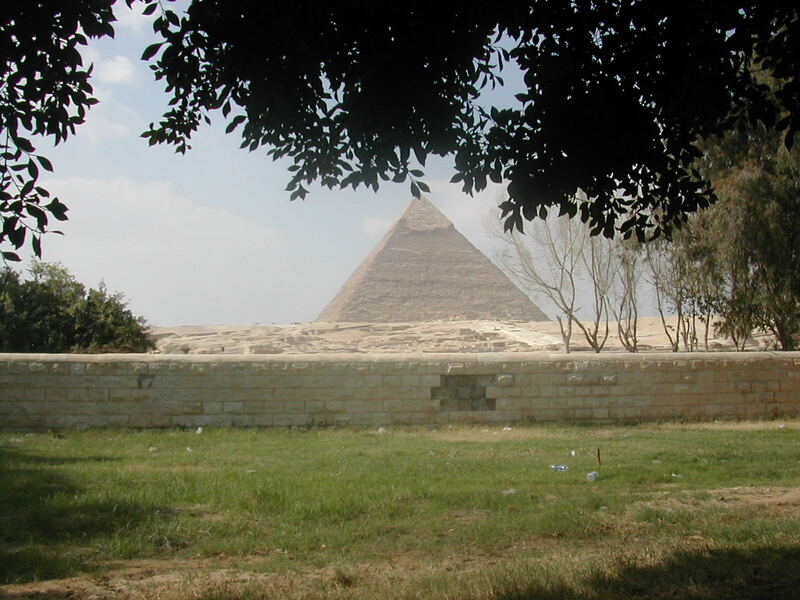 We photograph all three main pyramids, then drive on to see the Sphynx. Here, we see both male and female tour guides and vendors, even girls selling trinkets. "Onto the bus! Time for lunch!" We're off to nearby Sakkara, the site of the very first pyramid. But first, lunch in a garden restaurant Mohammed has found for us. It's called "Sakkara Nest" because it's like a bird's nest in a garden. Yes, it is very large, but tranquil, like nothing we have ever seen. It's almost empty. Oh, Egypt, where are all the tourists? You're going to have to work very hard to win them back again. A waiter in a white shirt and tie escorts us to a long table in the middle of the garden. Here is a link to a website where you can read about Cairo as well as view the restaurant. We are going to have an Egyptian barbecue! The air is already pungent with the scent of spices and wood smoke. Peter and I sit down. I am unhappy to discover that Pouty Lips is almost across from me. Her parents are directly opposite me. The mother is nice, but very timid. Can we find anything to talk about? And then someone sits down at my right side. I don't believe it - it's Mohammed! Now I have him almost completely to myself. But I discover that he is no conversationalist. If I want him to talk, I'm going to have to do the work. The poor guy needs a break, though. He's getting hoarse from talking so much. Germans aren't generally very good conversationalists. Peter likes to concentrate on his food when he eats. I sit there in silence for a few minutes, but I hate the silence. I remember something I saw on TV last night while zapping the channels. You can get Deutsche Welle in English! I sometimes use Deutsche Welle articles with my English students when we want to discuss German news in English, but you can't get this TV channel in Germany. I tell the parents and Mohammed about a story I watched about Babelsberg in Potsdam, the Hollywood of Germany. The parents are from east Germany. They're interested in what I have to say. So is Mohammed. He asks a few questions about Babelsberg. I'm feeling better with a full tummy. We're eating kefta, barbecued meat balls. Delicious! Along with tahini, pita flat bread and rice. I notice a group of school kids across from us. They're all wearing identical green polo shirts. None of the girls have their heads covered. I ask Mohammed what he knows about them. "I don't know. I'll go ask." They're students from a language school. "Language school isn't what you would normally think of. It's a private school where the entire curriculum is taught in another language. These schools are private and expensive. These kids are at an English-French school." Are his kids in a language school? Yes. German? No - they go to an English school. As the children leave, they wave. One of the less shy ones says "Good-bye" in Engish. Then we leave for Sakkara. Sakkara is actually a series of pyramids and buildings. Wikipedia calls it "the oldest complete stone building complex known in history". We first enter one of the tombs, famous for their murals. We see amazing water scenes, complete with people fishing, even a crocodile about to eat a hippotomus just being born. They are so sweet, so ordinary, showing everyday life of Egyptians 5,000 years ago! We return to our hotel. The road, as usual, is full of traffic. We pass several mini-buses carrying school children, labeled "language school". The one that makes me smile advertises the "Wisehood School of Language". I sit next to Claudia and ask how she's feeling. A little bit better. We chat. I tell her I have a project in mind - I want to write a blog about our trip. I want to include my experience of Germans in it. She says, "We're a great bunch of people, aren't we? I think this is a wonderful group." I feel ashamed. I've been looking at what I don't like. Claudia, even though she doesn't feel well and hasn't felt well the entire trip, has befriended every single person. But the journalist told me not to worry about making pointed remarks. It makes the reader react. I'm not so sure. I do want to be kind, but people aren't always so easy to like. Claudia wants to know who I find especially difficult. Is it the Austrian doctor? Yes. Yes, she finds Mr. Cool difficult too. She changes the subject. "I think Mohammed likes you." Yes, I've noticed that too. It's almost embarrassing by now. I wonder why, I tell her. "Oh, that's easy. You're so open, so interested. You accept his culture." I know that's true. But I feel there is more. There is a spiritual connection. I'm the only one who asks questions or shares anything about a personal faith. I sense that for Mohammed, as for me, connection with God is the most important thing in life. It is this connection that connects us to everything else. For once, we arrive back at the hotel early. It's only afternoon. I have time to go to the hotel jewelry shop and see if they can do anything about the ankh necklace I gave Peter. It's too small for him. I find a handsome young man about the age of my son Jon. Yes, he can help me. He sells me another necklace I can use to add beads. He shows me his perfume department. I end up buying two bottles of perfume, and a vial of kohl. "Use it - it will make your beautiful eyes even more beautiful." I don't know how to use kohl. "Don't worry - I will show you. Just come with me." He leads me back into the jewelry shop, turning his head every which way. Then he proceeds to paint my eyelids. "I have to be careful. If anybody sees me doing this, they'll kill me! I'm not supposed to touch a woman." I wonder if he really is taking his life in his hands. "Now you look beautiful. See?" He brings me to the mirror. Yes, it looks sort of like gray eye shadow. "Your husband will be pleased." This young man, whose sister is sequestered at home, is one of the Egyptians teaching me how to be a woman. Does she already know? I return to Peter, who thinks I look ravishing. We find ourselves seated at dinner with the couple who found the towels on the boat spotted and the bathrobes grungy. They have been to Africa. We already know this from having overheard them talking to others. We ask them about what they have seen. They stayed with a German family in Namibia - farmers, who had so much property, you could do a whole safari and never leave their land. People like these live very well, they say. They open up more and more, with story after story about Africa. They are turning out to be really interesting people, not at all the stiff Germans I had judged them to be. Almost everyone in our group wants to go out onto the terrace for drinks. We join them. The terrace bar has shisha pipes. Peter asks me if I mind if he smokes the water pipe. No, not at all. I think it will free him up more. He's so afraid of doing the wrong thing. Unsure, he asks me again. "Really? Are you sure?" Yeah - go ahead. He orders a bit of tobacco and the waiter brings the pipe, showing him how to use it. At first he coughs, but before long, he's got the hang of it. He says it tastes really good. And he looks good, too. Virile, manly. He offers it to me. I take a drag. It does taste good, but I cough. I try again. I hear a sharp "Nanzi!" from across the table. I look over to Mohammed. He's half-smiling, but he disapproves. I hand the shisha pipe back to Peter. Despite Peter's numerous invitations to take a puff, I decline. I'm learning that a refined woman doesn't smoke water pipes. I can't believe that I'm respecting Mohammed's wishes, and that I even want to. But I seem to be in a new kind of school, where the lesson is "womanhood". I've always been a diligent student.